Nail Art Mash Up #1 - Cinderella, The Very Hungry Caterpillar & more! Hi everyone! I figured it was time to give you a wrap-up of my latest nail art videos. These first two are nails I wore when I went to Australia recently - one hand for the kiwis, one hand for the Aussies. You can click on the picture to go to the tutorial, as with all the photos in this post. I love that black and white are our national colours - so classy and versatile! Not quite as much of a fan of the aussie colours, but they still turned out alright. I tried introducing gold into this while filming, but ended up removing it as it looked gross - too many 'big' colours! I really liked painting the silhouettes of the kangaroo and the kiwi on - and adding dots is always an easy way to spice up water marbling. My personal favourite out of this bunch of videos is this one - it's a bit different in the way I narrated it but I had so much fun! Introducing... The Very Hungry Caterpillar ☺. This was, of course based on the very popular children's book by Eric Carle. The two hands of this design tell the story of The Very Hungry Caterpillar, which I became quite familiar with over the week I wore these. I was on practicum at the time, and the children there were learning about the butterfly life cycle. For my last week I painted these as a surprise and they were pretty excited! One little girl in particular would ask me to "tell the story, tell the story!" then listen in awe as I tried to remember the words while popping out each finger. I'd finish with "... and he was a beautiful butterfly!" she'd smile widely then jump up and down and say "again, again!" So yeah, pretty familiar with this story now. I recently got a new camera, and some of these pictures were taken with it. I'm still figuring it out (or rather, asking my cousin every time I hit the wrong setting) but things are slowly coming together! These are photos I took with it (it's a Canon 600D), of this easy negative space nail art. There was also a giveaway with this video, which closes tomorrow - so if you're in New Zealand you can enter here. Again, click on the photos to watch the tutorial. These Cinderella nails are my second favourites from this lot, by a margin. I saw the film recently and really loved it... in fact, I've seen it twice now. It inspired this nail art design, and can I just say, that glass slipper was hard! "Have courage and be kind" was the tagline from the film, and I thought they were perfect. Good words to live by. These bunnies were done around Easter time, and were also a big hit with the kids on practicum. The mouths were a last-minute addition, but I'm so glad I did it - gives them much more expression! 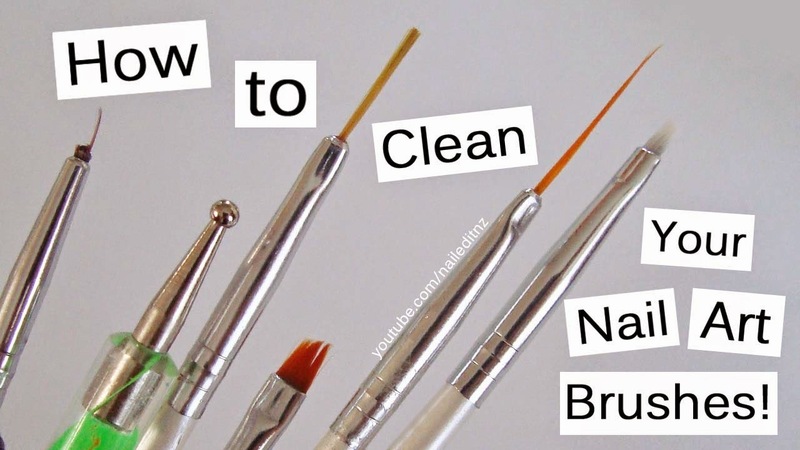 Finally, I also made a video about how I clean my nail art brushes. Hope you guys like all these new videos! I'll have a new one going up on my channel tomorrow, but in the meantime I've got a massive assignment to finish. We're so much more settled in Auckland now; starting to really enjoy it and look forward to everything that's happening here. I'll update you again at the end of May ☺.